Don’t you just love it when bloggers make seasonal/holiday recipes ahead of time so you can make them for that particular holiday? Me too. But unfortunately, I never seem to do that. It’s not a forgetfulness thing or a laziness thing as much as it is a THERE ARE NO MORE HOURS LEFT IN MY DAY thing. As much as I would love to plan my life around my recipes, my recipes are planned around my life. Okay, so not so little of an announcement. For me, this is HUGE. Like bigger than big. A HUGE leap of faith on my part — a big jump into my passion for writing and cooking. For the past few months, I’ve gotten more and more opportunities to do freelance writing for different publications, so Brad and I decided that rather than turning some of these opportunities down, I should quit my job and pursue it full time. I’m incredibly excited and incredibly scared, all at the same time. While freelancing is creatively fulfilling for me and continuously challenges me, this hasn’t been an easy decision. If you know a freelance writer, then you probably know that pursuing this passion doesn’t always equal a big paycheck. This decision will definitely come with some financial sacrifices. But I’m ready and willing to make those sacrifices. And thankfully, I’m married to a wonderful man that supports me 100% on pursuing my dream. Without his love, support, and willingness to make sacrifices with me, this would not be possible. Seriously. I count myself so incredibly blessed. And I’m also incredibly blessed because my current employer has offered to keep me on part time temporarily. I never dreamed this would be a possibility and am very grateful for the ability to make a transition instead of a complete break-off. Now that I’ll be able to purse writing many more hours a week, it’s only fitting that I focus on this little blog of mine even more. If you’ve been reading for a while, you know that there are weeks where nothing new seems to happen over here and those are usually the times were my personal or professional life have zapped all the energy from me. And even though blogging isn’t exactly as lucrative as freelance writing, I wouldn’t have gotten anywhere without the hours (and hours and hours) I’ve poured into this blog. When it comes to the heart of my writing, it’s my meat and potatoes. So with all that being said, thank you so much for reading because I probably would have never kept at this thing if it wasn’t for those of you who support and encourage me — both in real life and via comments, emails, Twitter, Facebook…I’ll take support and encouragement any way I can get it. So now my life will be arranged a little more around writing and cooking, which just brings the biggest smile across my face. And you can count on seasonal/holiday dishes to be done before the fact…rather than three days later. 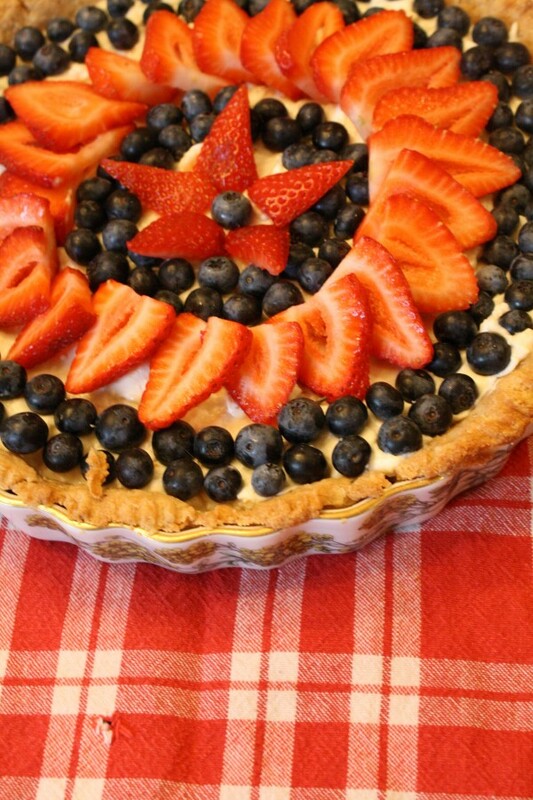 But for now, this little beauty is the tart I made for our July 4th dessert party which followed a trip to JJ’s Red Hots for their grand opening. 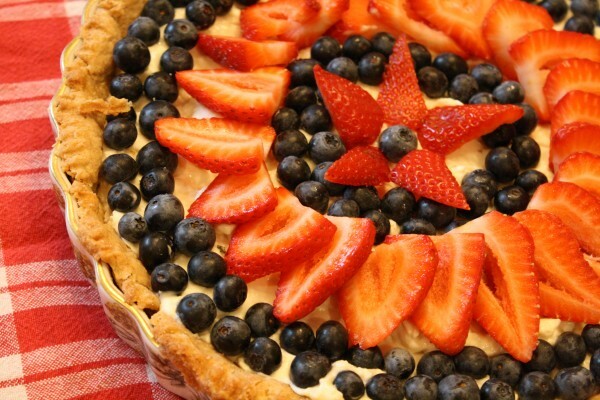 Since July 4th is officially over (now that it’s July 7th and all…) you can save this recipe for another patriotic occasion or scroll to the end where I made other fruit topping suggestions. This tart is no-frills, but simple and delicious. You can make it as easy as you like it by making your own crust or using a pre-made crust and you can easily adapt it to make it a seasonal tart based on the fruit you use (see suggestions below). 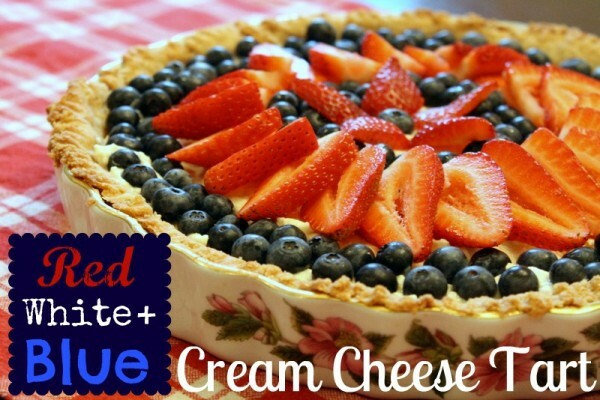 This version uses Neufchâtel cheese, which is more moist and lower in fat than cream cheese but you can use regular or light cream cheese in its place. 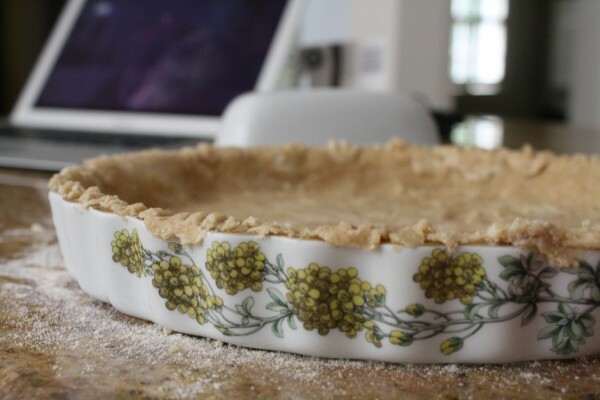 Preheat oven to 350 degrees F. Place pie crust over a shallow pie, tart, or quiche dish (I used a ceramic quiche dish). Trip the edges of the crust so it fits just to the rim of the dish and use a fork to press the crust securely to the dish. Poke the crust several times with a fork to allow for even baking. 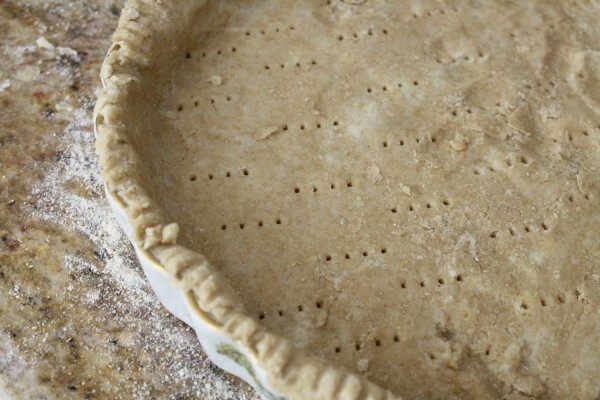 Place pie crust in oven and cook for 25-30 minutes or until the edge of the crust begins to brown slightly. Remove from oven and allow to cool. In a large bowl mix together the Neufchâtel cheese and the honey, sweetened to taste. Once pie crust has cooled completely, spread cheese over the crust evenly with a spatula. 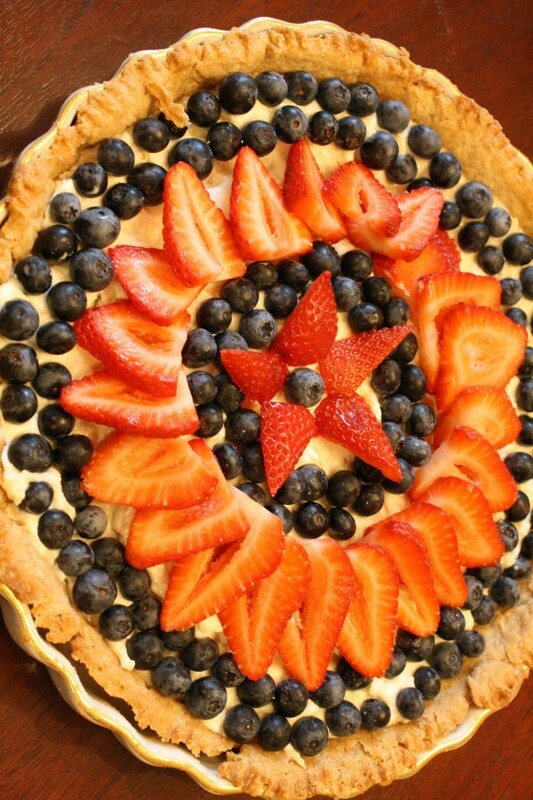 Decorate the tart with berries by making two rings of blueberries around the outer part of the tart, then a ring of strawberries, slightly overlapping (see photo). Make two more rings of blueberries adjacent to the strawberries and. 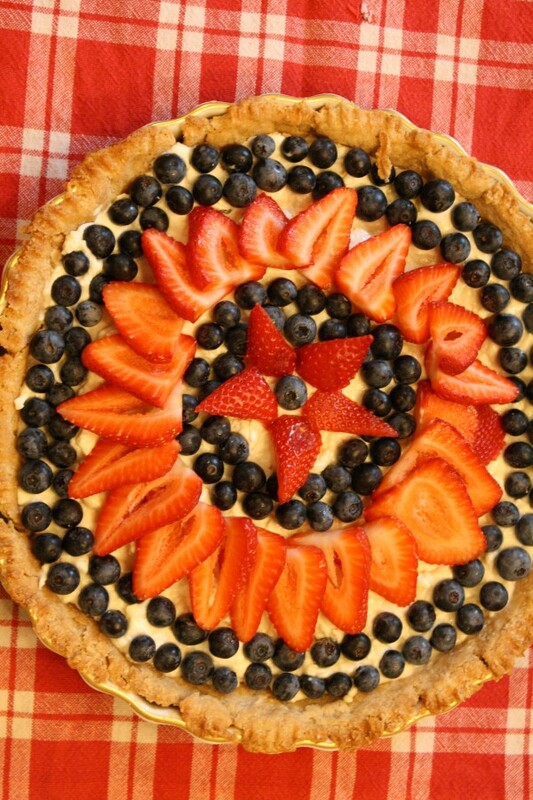 Cut a strawberry into five triangles and finish the tart off with a five-pointed strawberry star with a blueberry center. Place into refrigerator until ready to serve and serve chilled. – Banana split: decorate with sliced bananas and maraschino cherries with chocolate syrup drizzled over. 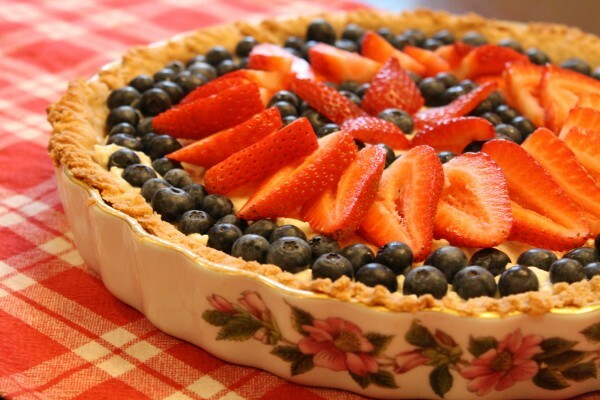 – Berries: decorate with blueberries, strawberries, blackberries, and raspberries. 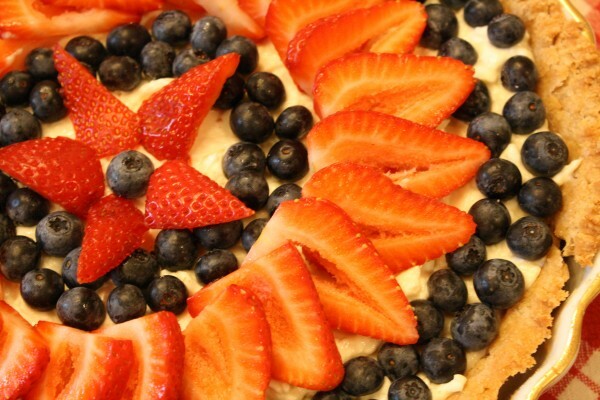 What I love most about this tart is that its made with real food — whole and healthy ingredients. You can make it as sweet as you like and you can also customize it based on the time of the year and what fresh fruit is available. I’m so excited to continue sharing recipes like this with you and I hope you’ll stick along for the ride during this new adventure in my life. congratulations kelly!! I’m smiling ear to ear for you! Kelly, I’m pleased to see this decision. You are truly blessed that Brad is willing and able help support this change. But you are most certainly a superb writer, and creative in your presentations and full of ideas AND even very good on camera for those opportunities, easily good enough to make this change. This is gonna work out fine. And I can’t wait to see it. Thanks so much Dave. As always, I really appreciate your kind words and encouragement. I really value your opinion. Congrats Kelly — and good luck! Congrats to you!! I have been a loyal reader and cannot wait to see what’s in store. Best wishes! And I truly appreciate your loyal reading so so much. I hope you enjoy reading as much as I enjoy writing and I can’t wait to pour my heart into writing very soon. 🙂 Thank you. First let me say when I saw that you had very exciting news…my mind raced to something quite different and I could not wait to open your blog to see what was going on? I thought a new addition to the family might be announced… 😉 , BUT this new IS incredibley wonderful!!! I know that everyone is so excited for you, that you are pursuing your passion on your blog and with freelance writing! With following your passion comes new opportunity and I will so be praying for you. I will pray that the door fling wide open for the pubulisher to grab your new material so the reader may have the chance to enjoy your talents. You are blessed with good family and a wonderful husband for support….so with all that said…CONGRATULATIONS for this new venure in life!! Ha! I thought some people might think that, but I’m going to take one life altering thing at a time. Thanks so much for your encouragement. Wow! Congrats on making the big leap! You’ve worked hard to create these opportunities…glad to hear you’re getting a chance to take advantage of them. Good for you! Thanks so much Scott. That means a lot. How freaking AMAZING!!! I am so proud and a teeny bit jealous! You totally deserve it though, I can’t wait to see what kind of fab publications you get a byline into! Thanks so much April. I’m not sure I deserve it, but I’m going to work for it regardless. Thank you for your kind words. They mean a lot to me. Congratulations Kelly! I am so excited for you! AMEN for a supportive man! Phil’s words to me are always “Do what you love until someone pays you for it.” That has been a mantra of mine that is just starting to become true for me too. I’m so excited for you and for your new adventure. Keep following your heart. We’ll be able to commiserate over coffee and computers very, very soon. Yay! That Phil is such a wise man. You can tell him I said so. 😉 Can’t wait to compare notes with you over coffee. Yay! Wowie!! That is super exciting news!!! Congrats chicka!! Can’t wait to follow along on your new adventure!! Oh and that tart looks delish! Best wishes on your news. You have a great blog. Thanks Leigh for the best wishes and the kind words.